GREENSBURG, Pa. (Tribune News Service) — Rocky Bleier smiled and posed for photographs with a line of Pittsburgh Steelers fans, showing them his Super Bowl ring while autographing copies of his book, Fighting Back: The Inspirational Journey of American Hero Rocky Bleier. But Bleier stopped when Bryan Bullock shared the story of his father, Ronald, a Vietnam veteran who was wounded by grenade shrapnel in his leg, foot and lower back — the same injuries Bleier suffered in the war. Bullock was thrilled to meet the Steelers legend Monday after making the trip to training camp at Saint Vincent from Reidsville, N.C., just north of Greensboro, and happier to get a personalized autograph of Fighting Back to take home to his father. That was the inspiration for Bleier to re-release his biography, which chronicles his growing up in Appleton, Wis., to winning a national championship at Notre Dame to fighting in the Vietnam War and the remarkable recovery that led to four Super Bowl rings with the Steelers. 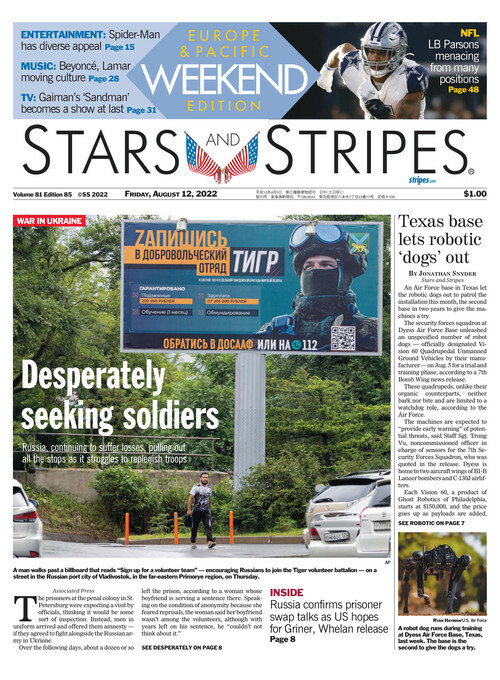 The new edition, partnered with Leadership League, includes a foreword by Steelers left tackle Alejandro Villanueva, a former Army Ranger who served three tours of duty in Afghanistan. It also has two new chapters written by Post-Gazette columnist Gene Collier, who collaborated with Bleier on his one-man play he has performed. Proceeds of his campaign, Fighting Back for Veterans, will benefit the Veterans Leadership Program, Joint Training Facility and Legacies Alive, organizations that provide services for veterans and their families. So Bleier isn’t just fighting back. He’s giving back, too. That’s not the most impressive part. Bleier, now 72, leaves Friday to visit Vietnam for the first time in 49 years, since he was seriously injured in 1969. An ESPN camera crew will film Bleier for a documentary as he visits battle sites such as Chu Lai and Heip Duc, where his battalion guarded landing zones and where he was twice wounded, first by enemy fire and then by shrapnel from a grenade. Vietnam veteran Keith Welteroth can’t imagine taking such a trip. Walt Yager was instrumental in bringing The Wall That Heals to Renziehausen Park in McKeesport last week to honor the city’s two dozen soldiers killed in action during the Vietnam War. It was quite a scene to see Yager and his wife, Lavonne, asking Bleier to autograph their jerseys — Walt’s a green Notre Dame replica with No. 28 and Lavonne’s a black Steelers throwback with No. 20 — and thanking him for serving as a voice for Vietnam veterans. Not that Bleier is expecting his trip to Vietnam to reopen emotional wounds, even though he lost friends with the deaths of fellow soldiers. That’s the story of the Steelers fans, especially those who waited patiently in line to share their Vietnam War stories with Bleier. Bullock got a personalized autograph for his father, Ronald, who earned two Purple Hearts but dealt with PTSD from the Vietnam War. Bryan didn’t understand why his father kept time with the Rolling Stones’ “Fade to Black,” pinching his leg or twitching until he was older. Finally, Ronald shared that it was how he trained himself to stay alert on overnight watch in the war zone. As Villanueva notes in the foreword, the Army still uses the Vietnam War to teach its tactics to a generation of soldiers. Bleier is more concerned with a U.S. military that relies too heavily upon volunteers, noting we have been in the Middle East longer than Vietnam. A Gold Star daughter, Noreen Doloughty has visited Vietnam in search of answers about her father’s life and death and is excited to watch the documentary, so that she can see Bleier visit places she didn’t go and how the places she did see have changed. Vietnam holds a special place in her heart, as her father, Army Staff Sgt. James Cornelius Doloughty, was killed in Chu-lai in July 1969, when she was only eight months old. As Bleier signed autographs under a tent during a downpour, she shared her admiration for the Steelers legend. Now, Rocky Bleier is ready to tell a new one. It promises to be super. Running back Rocky Bleier of the Pittsburgh Steelers talks with servicemembers during a USO tour of bases in South Korea in March, 1975. Bleier served with the 196th Light Infantry Brigade of the Army's Americal Division in Vietnam, and suffered severe leg wounds that threatened his football future. He worked his way back, and was a key member of the Steelers team that won four Super Bowls.